Thank you for visiting our website, we are really glad you came. Chances are you are visiting our site because you feel a call to work in French speaking Canada. Here are some key things you need to know. FIT4M language studies are provided by Université de Québec à Montréal (UQAM) and Rosetta Stone Language Learning. 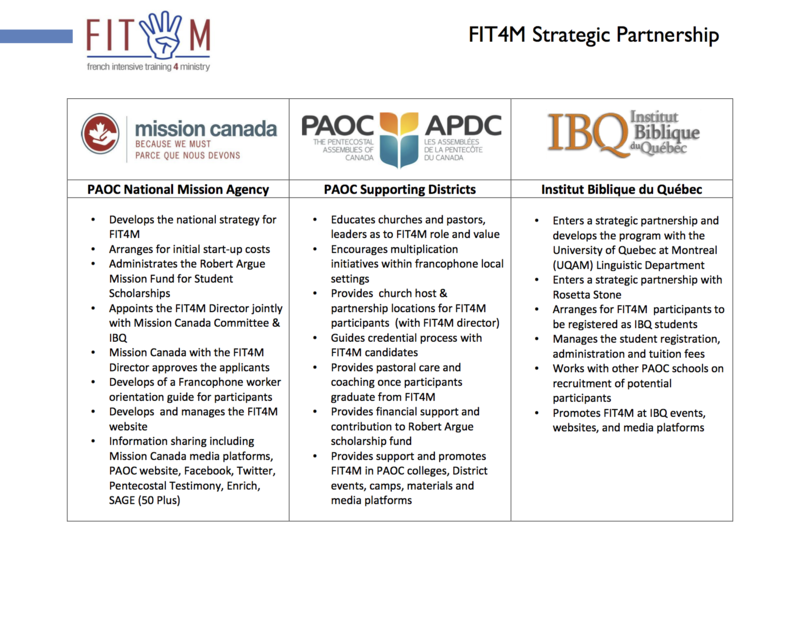 FIT4M is a one year Bursary funded program. These bursaries provide assistance to cover tuition, books and basic living expenses. The major qualifications for a FIT4M bursary are: a Bible College Graduate with an average record of Academic achievement; and a willingness to give at least two years of full-time French Ministry after graduating from the program. I believe providing essential language training and cultural adaptation will help applicants fulfill there calling. What a great idea! What a blessing to Québec! When we see the results of the previous FLITE program in the 70”s and 80’s, we realize that our Lord is still calling people to minister alongside local churches and ministries in Francophone Canada. FIT4M will serve to equip and train them with the tools that they need to be effective. Greetings from Edmonton. I find the reboot of FLITE very exciting. For years I dreamed of a similar vision like you’re about to do in FIT4M. A wonderful vision.